You need at least 5K subscribers to make any ‘real’ money from your email list. All you need to do is add an opt-in box to your website. Create a free ebook and the list goes on. If you’ve found yourself nauseated by the same old list building advice that constantly force feeds the ‘bigger is better’ theory and keeps you on the list building hamster wheel, keep reading as I break down the fundamentals of ‘quality’ list building. Newsflash: There is a right and a wrong way to build a list. I know this because I have built several email lists, both for my businesses and my clients’ businesses, using various strategies. Some, I built slow and gradually. Others, I built rapidly. And, along the way, I learned a lot of tips (and mistakes to avoid) that will help put you on the right path to build a profitable and engaged list of quality subscribers who will buy from you and rave about your offerings. What does it really take to build a list that matters? One of the biggest mistakes I see newbie entrepreneurs make is going from Zero to 6K subscribers (without addressing this step). In order to build your ideal list, you need to collect your ideal peeps. To do this, you need to get to know your ideal client. What does he/she like to do what for fun? What does she want for her business or life? How old is she, etc? Otherwise, you’ll end up with a fancy list of people who never open your valuable newsletters and are only interested in your annual iPad giveaway. (Whomp. Whomp). I’ve put together a quick list of ways you can get to know your subscribers/prospective clients to help you get started. List building is a non-negotiable for your business. But, like any other ongoing project in your business, you’ve got to get clear on why you’re doing it. So, why are you building your list? Is it because someone (your coach or friend) told you to? Do you genuinely believe you need to build a list? Do you have dreams of laying up on a beach somewhere and earning passive income from your email list? Take a moment to ask yourself these questions. (Got an answer? Great! If not, revisit this exercise until you do.) 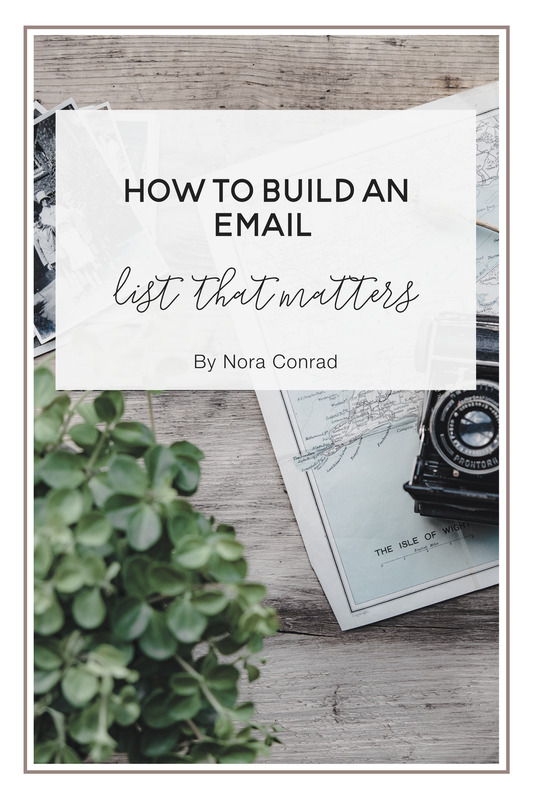 The last thing you want to do is build an email list just because or build a list because you want to make millions of dollars. Ever blame your email service for not sending an email? Ever try to send a confirmation email out only to find out your email provider has a 24-hour delay? Ugh. That can be so frustrating. Make sure you have the right tools in place before you go building your 6K+ email list. Are autoresponders included in my plan? Can I create landing pages? Which services does it integrate with (i.e. leadpages, wordpress, etc.)? What types of reporting is available? How and when can I access support? Will I have access to an email deliverability expert? Besides your blog, what other resources are available to help me grow my list and adhere to CAN-SPAM and CASL guidelines? I get a lot of questions about lead magnets. From what topic should I focus on to which format should I use. My response is always the same. Do what feels right (and follow these three steps, of course). If you’re a fitness coach and your ideal client is a stay-at-home mom looking to lose weight, you wouldn’t create a 40-page ebook. Instead, you might create a 5-minute playlist of uptempo workout tunes or an 8-minute workout video. The key here is to get to know your ideal client so intimately that you know what she wants before she asks for it. Then, you can create a lead magnet that speaks to that challenge. Here are some free tools you can use to create your lead magnets. As you get to know your ideal subscribers/clients, you’ll discover what makes them tick. I recommend collecting their feedback and questions within a notebook. Keep the notebook (or Evernote) handy so you can access it easily. Use this information to crete blog posts, content upgrades, videos and more lead magnets (of course). Remember, just because someone wants to lose weight, doesn’t mean they want to lose weight with your specific/secret regime so give them options. The worst thing you could do to your lead magnet is ‘set it and forget it,’ or add it to your website and think your work is done. It is your responsibility to make sure your lead magnet gets in front of the right people. One of the best ways to do this is to make sure you are promoting your lead magnet daily. Here’s a sample daily schedule to help you get started. Go into your favorite Facebook group/Google+ Community/Forum and post a non-spammy invite letting the members know about your lead magnet. Offer a content upgrade with this week’s blog post. Post your lead magnet on your favorite social media platform. Share a video around the same topic as your Lead Magnet and drive traffic to your lead magnet. Utilize a tool like Periscope or FB Live to expand your reach. Use a branded image and share your lead magnet on a different social media network. Take a moment to create your own weekly list building plan and check-in with yourself each week to make sure you’re on target. So many people are ONLY interested in going from zero to 6K subscribers and they’re getting side tracked by the latest list building fad (stop Googling and start doing it). You could certainly focus on quantity versus quality and play a numbers game...but I wouldn’t recommend it. You don’t need a large list to make money online but you do need an engaged list (and engagement begins with building relationships with your ideal subscribers).